The SCOTT AIR-PAK NxG7 self contained breathing apparatus (SCBA) is a respirator intended to provide respiratory protection to an individual when entering into, working in and exiting an objectionable, an oxygen deficient, and/or an unbreathable (toxic) atmosphere. 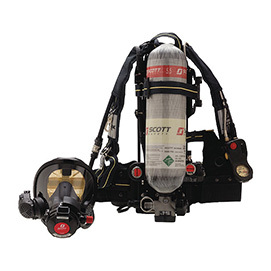 The basic SCOTT AIR-PAK NxG7 SCBA consists of a backframe and harness assembly, a cylinder and valve assembly to store a supply of breathing air under pressure, a dual path pressure reducer mounted on the backframe, a facepiece mounted pressure demand breathing regulator, and a SCOTT full facepiece with a head harness to secure the facepiece to the face. Need a price on Reconditioned Scott 2.2 / 4.5 NXG7 2007 Compliant SCBA's?